To include this great little book in a list of “medically themed” graphic novels may be stretching the point somewhat, or tending towards the medicalisation of normal life (doctors are good at that, but maybe not as good as Big Pharma). 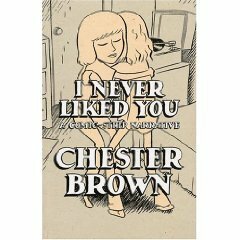 I include it because of the thread narrative that concerns Chester Brown’s relationship with his mentally ill mother. The main theme of this memoir is Brown’s somewhat troubled adolescence, growing up in the 1970’s in a Montreal suburb. Chester is the slightly geeky teenager whose quiet, thoughtful manner and skinny, longhaired good looks get him plenty of (seemingly unwanted) attention from girls and plenty of hassle from boys. Carrie, two years younger, is in love with Chester. Unfortunately Chester is in love with her friend and neighbour Sky. Those long ago feelings of isolation, first love and heartache are skillfully evoked. Appart from a declaration of sentiments, nothing much happens, but Brown, with his minimalist monochromatic style, eloquently captures the awkward and circuitous attempts of teenagers trying to make physical and emotional contact. Not that Chester is prone to showing much emotion: his is the least demonstative of characters. Behind his opaque glasses his face remains almost perversely expressionless. His mothers bathetic attempts to get him to display some affection towards her go unrewarded. The story of Chester’s mother provides the most haunting part of the story. She is introduced early on as a rather odd character, with strong religious convictions and prone to sudden awkward and embarrasing monologues for the benefit of her two sons. She introduces the subject of mental illness, fairly late on in the book, when she announces that she is not well and is going to get herself admitted to hospital to sort herself out. Knowing she will not be out before his birthday, she gives Chester his presents as she leaves for the hospital. We are not told the nature of the illness, but we know subsequently, from Brown’s 1995 strip My Mom was A Schizophrenic, what diagnosis was reached. Wandering around in a confused state (drugged up, one wonders?) she has fallen down a flight of stairs. When the family visit, she is a broken, incoherent mess, unable to move from her bed. Chester feels he should tell her he loves her, but can’t. She later dies. Chester is unable to cry. It struck me as a heartbreaking example of iatrogenic damage.